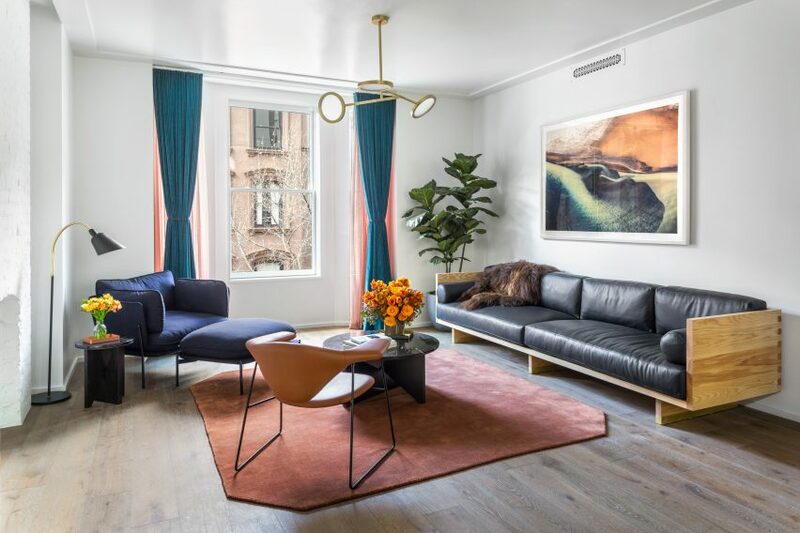 New York design showroom and gallery Matter has outfitted a model apartment in a historic Brooklyn Heights hotel undergoing conversion into residences. Matter selected and styled the furniture and accessories for one of 29 condos inside the 12-storey building that once housed the Standish Arms Hotel, completed by local architect FS Lowe in 1903. Developers DDG and Westbrook Partners bought the building at 171 Columbia Heights in 2016, and have rebranded the property as The Standish. The two-bed, two-bath home features a mix of light tones and bold colours that the team chose to set the apartment apart from typical show spaces in new-build projects. "A welcome contrast to the neutral model homes typically presented in today's luxury buildings, Residence 3C at The Standish serves to delight the eyes and engage the senses with the use of bold colours and patterns as well as structural furniture pieces and home accessories," said the team. From the entrance, the master suite is located off the hall to the left, while the guest bedroom and bathroom are accessed separately further down on the right. The corridor culminates at the living, kitchen and dining areas, which together occupy a light-filled, open-plan space. Wooden floors run throughout, except in the bathrooms where a similarly coloured stone is used. Kitchen surfaces are a light-coloured marble, used against white cupboards with brass handles and fixtures – matching those in the bathrooms. To furnish the apartment, Matter used pieces from the collection produced by its brand Matter Made, including some from its newest designs shown in Milan earlier this year. Made in Brooklyn, these include tables, chairs, light fixtures, and accessories by designers such as London-based Philippe Malouin. A branched brass ceiling lamp in the living area was designed by Matter founder Jamie Gray, while a single-ring version from the same line hangs in the bathroom. The leather sofa was custom-designed by Matter Made for the project. Standout pieces from other designers include a light with an orange-green glass shade by Bec Brittain in the master bedroom, and several sconces and an umbrella stand by Apparatus. In the living room's bay windows, thick teal curtains overlay millennial pink drapes. A darker blush hue was selected for a geometric rug by &tradition in this space. Boldly coloured artworks that compliment the palette of the furnishings. "Matter sought to create a contemporary Brooklyn style and aesthetic, drawing inspiration from the building's history and turn-of-the-century style," the team said. The model home is priced at $2,435,000 (£1,876,000). Others in the building range from a one-bed marketed for $1,290,000 (£990,000) to a five-bed listed for $7,135,000 (£5,480,000). Photography is by Robert Granoff.